Okay, so I am not sure how to write this post without seeming either ungrateful or like I am bragging. See, my kids, being both Asian and Caucasian, tend to attract attention. In Japan, people think they look American, and in the US, people think they look Japanese. Since I look at them all the time, I pretty much just think they look like Sky, Pink P, and Stow, but apparently, they are worth starting at. They also seem to elicit unnecessary comments from complete strangers. On a recent airplane trip with Stow, I was reminded of some of the things people say that leave me speechless. 1) He should be a model. I seriously don't know how to take a comment like this. For some reason random strangers seem to think that both Sky and Stow should be modeling clothes in a catalog somewhere. I suppose I should take this as a compliment, but it actually just feels like a lot of unnecessary pressure. Suddenly I find myself worrying about whether I am wasting their hidden talents by not hiring an agent and ushering them into a bevy of commercials. Then I realize that I probably don't want to be mom to a child star wash out. Somewhere in the middle of these two thoughts, I remember that I will always be a poor academic and for a few brief moments my head is filled with stars and diamonds. In the end, it just reminds me that our culture is obsessed with how we look and not with who we are. And then I feel bad because my kids will never be as perfect as they seem to look. Am I overthinking things? Probably, but it's pretty weird to have someone tell you your kid could be a model. I never have figured out the appropriate response. Is it "Thanks," or should I say, "Will you be his agent?" 2) What a well-behaved baby! Again, a compliment surrounded by all sorts of land mines. This one implies that I have some sort of control over how my baby is going to act. Since I don't, I can't even accept the compliment in good conscience. And since my mom always told me to be a gracious recipient of kind words, I am usually flummoxed when I try to think of a way to respond. Do I tell the complete stranger the baby's entire sleeping and eating history so that they realize he's well-behaved because he is currently content, or do I pretend I don't hear and walk away? As parents, it doesn't take long to figure out that we really have very little control over the behavior of our children. Sure, we can discipline them and train them to behave appropriately in various situations, but they are still (and always will be) individuals with their own ideas about how things should go. This is of course much more obvious to those of us with kids on the spectrum. I'm pretty much thankful on a minute-by-minute basis when any of the kids are behaving appropriately, so I'd rather believe that others are not watching and judging me like that. 3) Where is he from? More than once I have had complete strangers inquire about the origins of my children. The first time I got the question, I couldn't figure out what the woman meant. Apparently, a white woman with a less white, slightly Asian-looking child tricks people into thinking the child has been adopted from a foreign country. I'm not sure how or why this is the first, most logical conclusion, but then again, we've already established that people will ask dumb questions when they can't quite figure out what they are seeing. Each time I get a question about where my kids are from, I have to resist the urge to explain the birds and the bees. I also have to throw the emergency brake on my sarcasm because I can think of all sorts of awesome responses to that question that should not be uttered in public. Sky: (Mortified) We're eating bamboo babies? Pink P: Why do people shoot bamboo? Won't they hit the panda bears? This got me thinking about some of the other odd conversations we've had lately, so I thought I'd post a few. Pink: [Bang, bang, bang!] "Mommy, open the door!" Me: "I'm in the shower, what is it?" Pink: [Bang, bang, bang, bang!] "Mommy, hurry!" Me: "Honey, what is it?" Pink: "I think my bed is too small." Sky, reflecting on the big questions in life: "I just don't know if I believe in Jesus (pause) or Santa (pause) or Curious George (pause pause pause). Wait, Curious George is a cartoon so I KNOW he's not real..."
"You should really wear more dresses." "Mommy, I don't have a girlfriend." 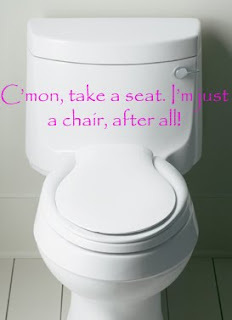 ‎"Mommy, did you know that a toilet is a type of chair? It's a type of chair that has a hole in it..."
Sky: "I liked your old hair". Pink P: "Mommy, you're not a BOY." Ren: "Did you MEAN to do that?" After explaining to Sky (upon being questioned) that I don't wear skirts because I have always been a tomboy and prefer pants, and after explaining, against my better judgment, what a tomboy was, he said (exactly what I expected him to say): "Then I'm a tomgirl--I like doing girl things and boy things." Pink P: Strawberry Pink P because you eat them! Excerpt from a conversation on the way *home* from school (after a call from the school nurse): "We both threw up on the same table. Ryan threw up first, but I threw up more!" ‎"Mom, Pink P doesn't know anything. She doesn't even know what 'alliteration' means!" Sky, as we are walking out the door to school, "When I grow up, I want to own a store that sells hats, gloves, and sweater pants." Sky: Dad have you ever seen a rainbow? Ren: Yes, I walked on top of one once. Sky: (after a brief pause to consider this) No you didn't! Rainbows are made from water and sunlight. You'd fall through. Only angels walk on rainbows because they have wings. "Mom, boys have pennies and girls don't." "Mom, first there were dinosaurs and then people. What do you think will come when people are gone: robots or aliens?" There are all sorts of reasons communication is challenging at our house. There's the bilingual thing, the pragmatic language thing and the verbal processing thing. Still, it makes for some pretty interesting conversations! Now that we've moved, one conversation will no longer be necessary. 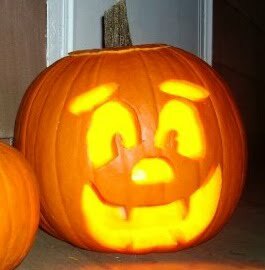 I will no longer have to find a painless way to explain why our pumpkin got smashed. The last time we carved a pumpkin, due to our proximity to campus, it made it exactly one day before some drunk college students smashed it. Me: "Oh, Honey, it looks like someone did something mean to our pumpkin." Me: "I said, it looks like someone did something mean to our pumpkin." Sky: (Slight pause). "Nuh-uh, Mommy. A bird knocked it off the deck, a squirrel pushed it across the yard, and a cat bumped it into the street. Then it got run over by a car." Well, duh. Why didn't I think of that? Unfortunately, the move has not eliminated our recurring conversation about the threat of falling meteors. 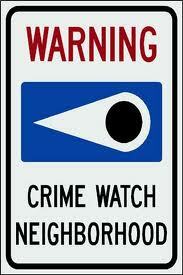 Our old house was 2 1/2 blocks away from the nearest sign that looks like this. So, whenever Sky began to panic about the imminent doom predicted by the neighborhood watch sign, I told him not to worry since we didn't live on the same street as the sign. Clearly, I argued, this meant that we were safe from all space debris. Alas, in our new house, Sky can see one of these signs from his bedroom window. Fortunately, recently he has started to read, so now he believes me when I tell him the signs have nothing to do with meteor showers. I think I'm going to miss the Sky that believed we lived in the middle of a meteor shower zone. That's a whole lot more fun than worrying about stupid criminals and pumpkin smashers. I've always kind of liked this sign. I mean, who doesn't hate an inconsiderate trumpet player? (Okay, okay. 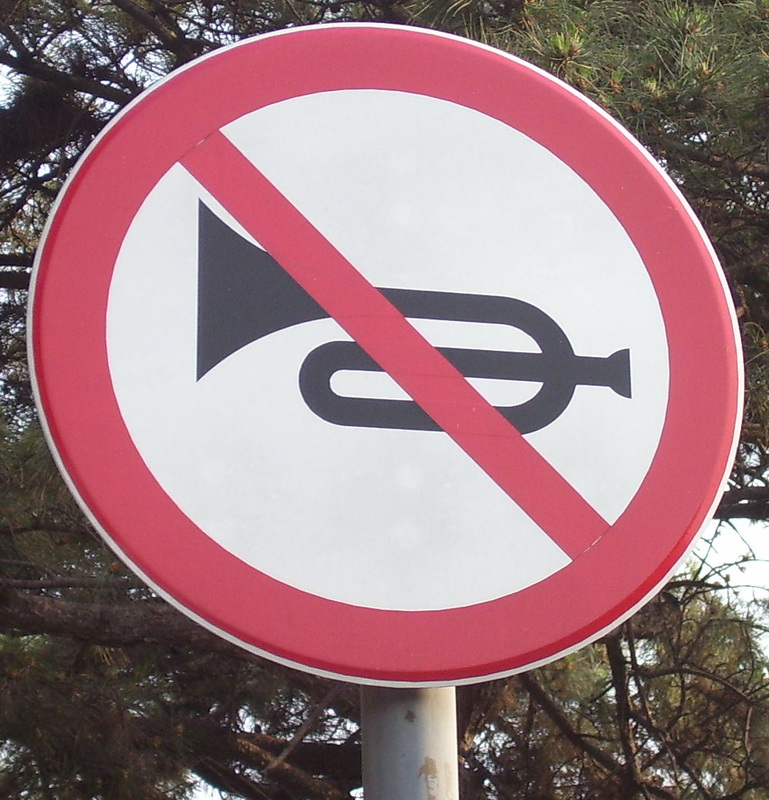 I know this is a "no honking" sign commonly found in China, but it's much more fun to think someone really has a grudge against trumpets). The most fascinating thing happened. I went to a case conference at Sky's school, and everyone agreed. We agreed that even though Sky performs at or above grade level, he has enough PDD-NOS funkiness to warrant special education support. We agreed that Sky needs OT support. That he should get speech therapy at school, and that he needs a social skills group, which he can also get at school. I'm not convinced that I haven't slipped into an alternate reality. Because, you know what else? Not one of the 10 people at that meeting said anything even remotely crazy or unexpected. Believe me, I double checked just to be sure. Plus, Stow sat peacefully on Ren's lap and smiled and/or slept through the entire thing. Our last meeting with part of the case conference group was literally a week after Stow was born, and ever since we have been employing the cute-baby defense. Now that he smiles non-stop (except when he's sleeping--that'd get a little creepy after awhile), it's particularly effective. He grins. He coos. And no one has the heart to be a jerk. Whatever it takes, people, whatever it takes. For the record, it only took 9 months since the diagnosis to get to this point (and 14 months since we decided to get Sky evaluated). The word perseverance has taken on a whole new meaning. Related Posts: Accidental Advocate Redux, Is it Okay to Laugh Now?